Drive 17th July -Drive to Huntsville to complete final packing and spend the night. 18th -Drive to White River Provincial Park, via Naturally Superior Adventures for our canoe rental. Sunday 19th -Breakfast, then on the water at White Lake. 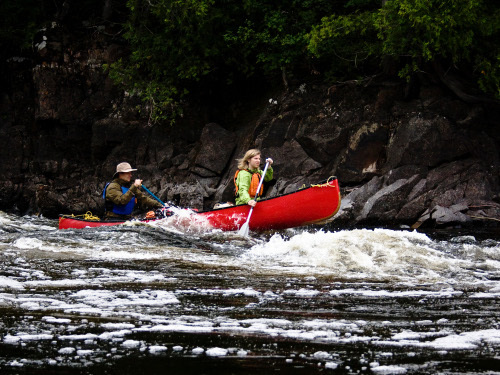 Paddle down river to the dam and short portage. mid-day -Lunch, carry Kapok Rapids, and camp at Abitibi Rapids. mid-day -Paddle to Jumbo Rapid and perform a half unpack and half lift over. Lunch on an Island. Next a Paddle to Chicagonce Falls and a portage around it with a short paddle to Angle Falls and another portage. No campsite below Angle Falls so a paddle to Domtar Rapid and camp for the night. Tuesday 21th -Breakfast, then run Domtar Rapid, evaluate Baptisimon Chute, one canoe to try and one canoe to portage (the portaging party stayed dry, the paddling canoe not so much). A long paddle to dry out. mid-day -Ess Rapids for a portage, then a long slow water paddle to Hayward Rapid which I believe we ran, then on to an island campsite just above Stash Rapids. Wednesday 22th -Breakfast, then a run of Stash Rapids and a portage at OilSlick Rapids. Next stop 2+km portage at Umbata Falls takeout. mid-day -Lunch while on portage route to Hydro Rapids, then camp and a swin in the Hydro Rapids. Thursday 23rd -Breakfast, then off to Twin Rapids a pair of puring spouts one pouring into a bowl of a lake and one pour out of it (a couple difficult portages). mid-day -Lunch after the last Twin Rapid portage, then another slow water paddle to Hook Falls and a quick up and down hill portage, then past the non-existent Rapids R and then portage at the serious Falls F. Next, out at the Chigamiwinigum Falls for a well maintained Portage route. Camp was made this even just at the opening to the Lake Superior on the mainland side of the river mouth. Friday 24th -Paddle Lake Superior to Hattie Cove, with a short stop at Picture Rock Harbour. Off the water and car shuttle at the Pukaskwa Visitors Center. mid-day Say goodbye to Pukaskwa National Park, quick lunch at a burger stop, then on to Toronto. Home 25th Back into Toronto at 5:00AM.